A traditional vessel for making light offerings to the Three Jewels. The offering of light to the Enlightened Ones increases wisdom, wealth and creates the causes for a strong and healthy body. Make our carved brass butterlamp a part of your shrine and let the light of wisdom shine. 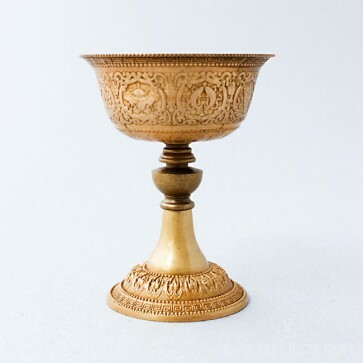 Crafted from brass and carved with the Eight Auspicious Signs, this delicate butterlamp is an excellent addition to your altar at home, work or place of business. The offering of light to the Enlightened Ones increases wisdom, wealth and creates the causes for a strong and healthy body. Traditionally, butterlamps in Tibet were filled with yak butter. As butter was quite hard to obtain, offering butterlamps on the altar was considered a very precious offering. The lighting of a butterlamp symbolises the illumination of wisdom - Buddha Shakyamuni’s realisations when he attained Enlightenment and dispelled the darkness of ignorance that obscures the mind’s true nature. For Tibetan Buddhists, a butterlamp offering also carries their personal wish to attain Buddhahood and aspiration to achieve the mind of clear light at the time of death, thereby experiencing liberation. Contemporary method: Place a suitably-sized candle or tealight in the butterlamp bowl. Traditional method: Affix a suitable hard wick/soft coiled wick to the hole at the bottom of the butterlamp cup. Fill the lamp with aromatic oils, clarified butter or vegetable oil.